Bodybuilding Championship, Tony Little was in a near-fatal car accident; afterwards he suffered from depression, and became addicted to pain medication and gained significant weight. He recovered, and developed his successful exercise programs and in-home training equipment, including the Gazelle Edge. The Edge focuses on weight loss, muscle toning, and cardiovascular exercise. The Edge is marketed on Tony Little’s Website, tonylittle.com. Several other models of the Gazelle are available with features like heavier tubing and water bottle holders; the Gazelle Edge is the lightest weight and most economical model. The premise of the Gazelle Edge is that the machine’s gliding motion works the muscles of both the upper and lower body while burning calories and improving cardiovascular endurance. The machine is remarkably smooth and quiet – and stable. The patented, dual-action split suspension provides a full-range of motion from a slow walk to a full run without sudden stops and without placing pressure on the joints; the low impact, aerobic workout is ideal for all fitness levels and ages. (Maximum user weight is 250 pounds.) Users can choose to place hands in a low, medium, or high grip to alter difficulty with different results for the upper body. The Edge features an easy-to-use and battery-operated (two AAA batteries included) 5-function workout computer providing immediate feedback on speed, distance, time, and approximate calories burned. A foldable footprint ensures easy storage. The non-skid foot platforms are extra-wide for added stability. The 1.5 inch in diameter, rolled steel frame is extremely sturdy and durable. The handlebars are covered with high-density foam for comfort. 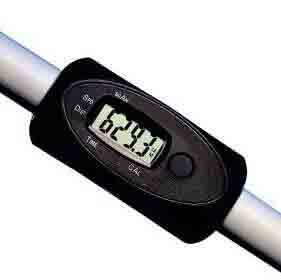 The Edge’s dimensions are 43 x 28 x 53.8 inches; its weight is 42 pounds. The machine folds up quickly into a flat position for easy storage – just snap the foot platforms onto the swing arms before sliding the frames together. And, it’s highly portable. Store it under a bed, or standing in a closet. The machine is also quite easy to assemble; it consists of a simple mechanism and a few working parts. Instructions are clear and concise. The company touts the Gazelle Edge as an elliptical which it is not. The Edge would be more accurately described as an arc trainer as feet do not travel in an elliptical path but rather an arc. It is priced just over $100. For the price, it’s an excellent no-frills, in-home exercise machine. Compared to many low-priced ellipticals which can be uncomfortable to use, with a jerky motion or a stride so short they work more like a stepper than an elliptical. This is not true of the Gazelle Edge. And unlike the Edge, most comparably priced – and even higher priced – ellipticals have poor reliability and satisfaction ratings. The Edge is generally rated highly by its users. Keep in mind, however, that the Edge is a basic machine. It does not use pistons. It does not have a heart monitor. And it has no resistance adjustment. Also, the machine does not have built-in training programs; the user must either buy Tony Little’s exercise videos or create his or her own exercise program using information provided in the accompanying manual. 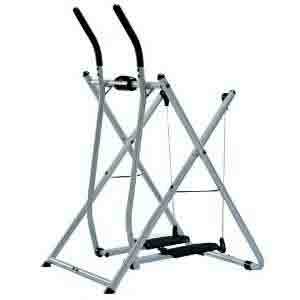 Nor does it have the fluid movement of a top-of-the-line elliptical trainer. Furthermore, there have also been occasional reports of squeaking parts, though lubrication with vasoline seems to prevent this difficulty. In short, for a mere $100 investment, the at-homer user should be most satisfied with the durable and sturdy Gazelle Edge, a basic, no-frills exercise machine that closely mimics the motion of an elliptical trainer, working the muscles of both the upper and lower body while burning calories and improving cardiovascular endurance. 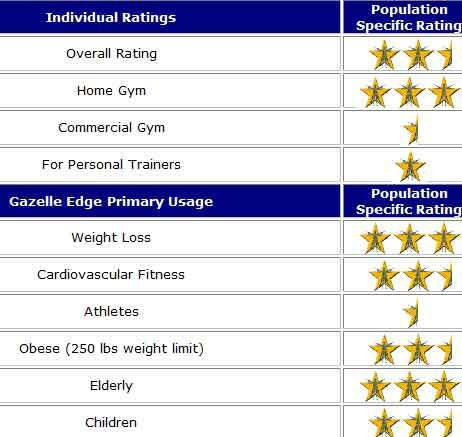 Who will Benefit from using the Gazelle Edge Review ? Where can I Buy the Gazelle Edge ? If after reading this Gazelle Edge Review you find it is for you, the easiest place to find one is online from major vendors such as Amazon which will deliver it to your door with no hassle and sometimes even free shipping. If you have some extra money to spend, you may also want to check out the higher-end Gazelle Freestyle review.